Alumnae and current female students in the Southern Illinois University Edwardsville School of Engineering (SOE) used their love for technology to inspire local middle and high school girls to consider a future in computer science during the SheCode event held Saturday, Dec. 2. The SOE Department of Computer Science hosted participants from Alton, Collinsville, Edwardsville, East St. Louis, Troy and other localities. During SheCode, participants worked with a team of peers and a mentor to create a mobile application. The students came up with their own idea, designed the app, and were able to bring it home to continue to develop as they desire. SIUE computer science students Taylor Dowdy, of Wood River, and Brianna Witherell, of Mascoutah, along with Dennis Bouvier, PhD, associate professor in the Department of Computer Science, helped during the event. Additionally, computer science alumnae, who are now working in the technology field, served as volunteer mentors during SheCode. They included Darla Ahlert, MS’15, a technology enablement consultant at Slalom in Clayton, Mo. ; Cathy Casey, BS’15 and Michelle Jaenke, BS’12, both of whom work at Monsanto; Lindsey Shelton, BS’14, with TD Ameritrade; and Mel Jameson, BA’16, with Coolfire Solutions. The field of computer science is a rapidly growing field with a projected employment growth rate of 19 percent by 2026. For more information on SIUE’s Department of Computer Science, visit cs.siue.edu. 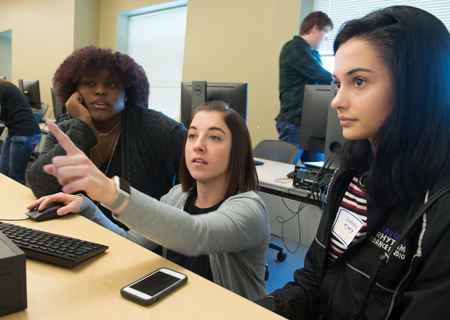 Photo: SIUE alumna Darla Ahlert, MS’15, (middle) offered assistance as Radricka Kelly-Olden, of East St. Louis, (L) and Izabella Tognarelli, of Collinsville, (R) worked together to create a mobile application during SIUE’s SheCode event. 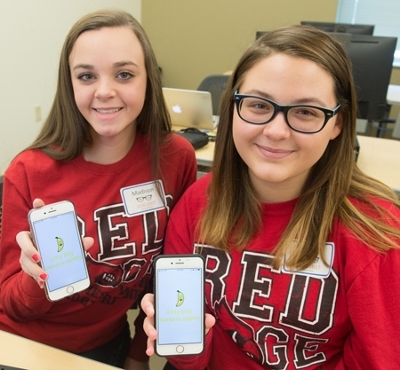 (L-R) Madison Wallace and Anna Miller, sophomores at Alton High School, display the mobile app they created during SIUE’s SheCode event.